Whenever I cook a roast chicken, or I buy a rotisserie chicken I save the carcass. I bag them up and store them in the freezer until I have enough for a large pan of chicken stock. 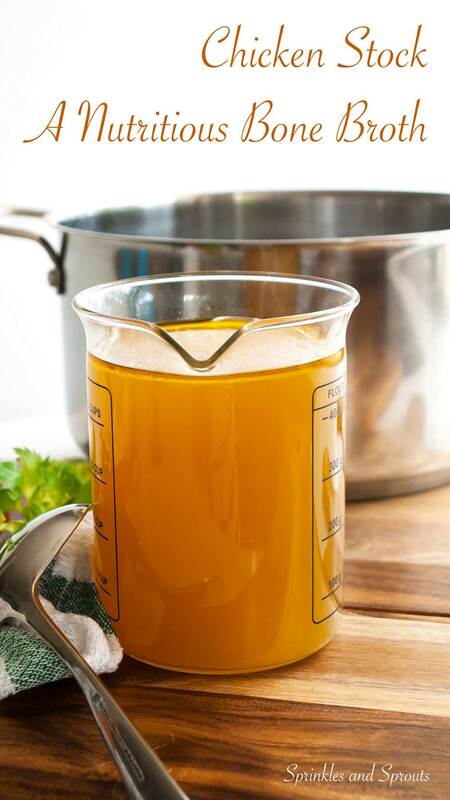 Homemade chicken stock is unlike anything you can buy, it’s rich and delicious and has an almost velvety smooth taste. That and the bones give it an excellent thickness. If you cook it long enough and with enough bones, your cold stock should thicken to a jelly consistency. If it does you know you have a great stock. I warn you this isn’t a quick recipe, the longer you can cook the stock for the better. You want every bit of flavour and goodness to come out of those bones. I cooked my stock long and slow, all in all the bones had around 8 hours in the simmering liquid. Some people might then remove the bones, cool the stock and remove the fat layer. I don’t, there are nutrients in that fat. Honestly! And also there is a lot of flavour in it. Due to the long cooking time, I don’t use meaty chicken joints as they go stringy and frankly inedible. This stock is about the bones, we want the nutrients and flavour from the bones, it after all alone a bone broth. This is why it takes such a long time to cook. 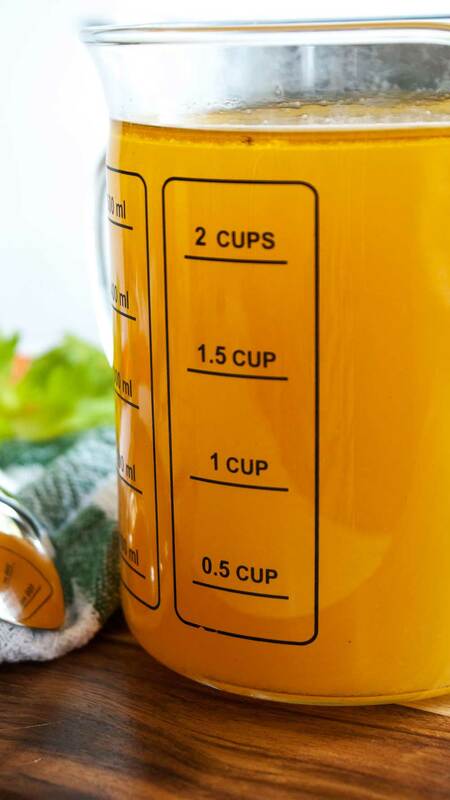 If you have a large slow cooker you can cook this stock on medium for 12 hours. If you are using a whole chicken or chicken pieces. Cook the meat in the simmering liquid for about an hour before removing from the stock. Strip the meat from the bones and add them back into the broth to keep cooking. Allow the meat to cool and then refrigerate until needed. The bones and vegetables become very soft after long cooking so I tend to strain this through a sieve lined with a new, clean j-cloth. This isn’t the cleanest process but it does leave you with a beautifully clear broth. When recipes call for a bone broth, this is the stock I use. It is packed with flavour. 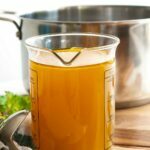 Chicken Stock - A homemade recipe for a rich, delicious and nutritious bone broth. Perfect for making chicken soup or adding to risotto. Place the chicken into a very large stock pot and add enough cold water to cover the bones. Add the cider vinegar and leave the mixture to sit for half an hour. Roughly chop the onions, carrots and celery. Place the pan on the heat and add the chopped veg, garlic and peppercorns. Bring the water to a boil, then reduce the heat to its very lowest setting and place on a vented lid. During the first couple of hours use a large spoon to skim off any foam/scum that rises to the top of your stock. This should reduce after the initial cooking period. 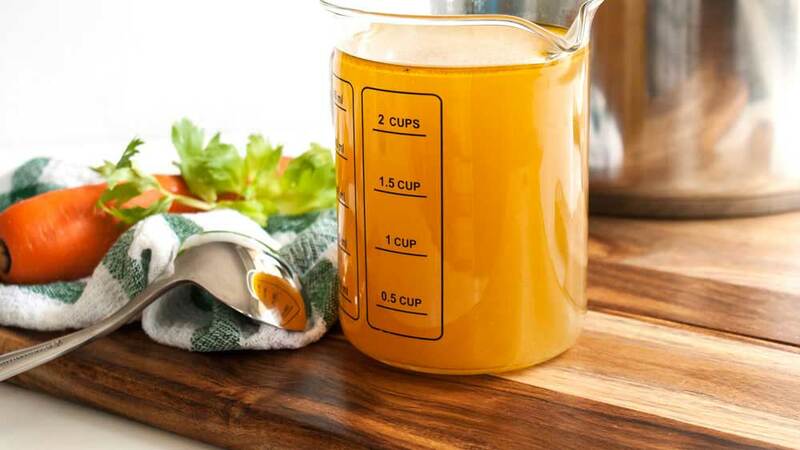 Allow the stock to cook at the lowest possible heat for at least 6 hours, 12 hours would be even better. 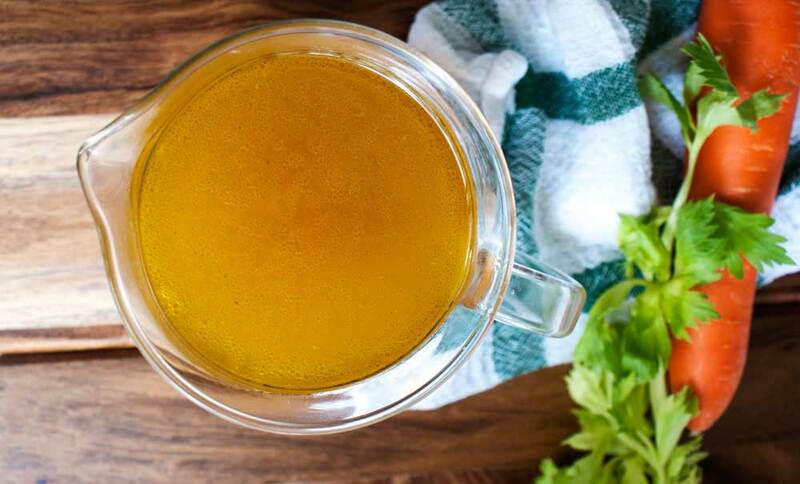 Remove from the heat and carefully pour the stock through a sieve lined with a clean J-cloth. You will need to do this slowly to ensure you don't dump all the solids back over the side of the sieve and into your stock. Even better would be do to it in 2 or 3 small portions. Return the stock to the hob, bring to the boil and boil vigorously for 10 minutes. Your stock is now ready to use in soups, risottos or to freeze for when you need it. There is no salt in this recipe, the elongated cooking time can vastly change the water level, making seasoning hard until the stock is fully cooked. I like to freeze the stock without salt and then season it depending on the dish I use it in. Hi Claire! My way of making stock is almost identical to yours! Whenever the kids would get sick I immediately made chicken soup, it is also so comforting! I don’t peel the onions or the garlic either. And I always use the turkey carcass at Thanksgiving to make stock! Nothing better when you have a cold than a bowl of chicken soup! I love homemade stock. I made a big batch of shrimp stock before I went away. Thanks for the inspiring post – I always have just store bought my stock but definitely am inspired to try make it myself now. Definitely give it a go, it tastes so much better and you can control the salt content. Your chicken broth looks really rich and I bet it taste really good too, I’m going to make soup this week and definable try your broth.